Luca Ferrari was born in Reggio Emilia on the 16th of February 1605. He worked in Ludovico Tiarini’s workshop in Modena in 1627, while he joined the “Fraglia Pittorica” of Padua around 1637. His first stay in Padua lasted about ten years (1634-1644), during which he drew inspiration from Paolo Veronese and Francesco Maffei’s works and at the same time he introduced the narrative taste and the accurate naturalism of Emilian paintings into the Veneto region. After spending some years in Reggio to complete the decorations of the Basilica of Santa Maria della Ghiara (1643-1648) he returned to Padua. 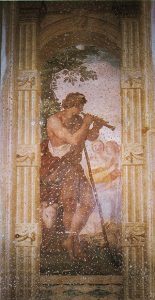 He frescoed Villa Selvatico in Battaglia Terme with episodes of Antenore’s life in 1650 and in the following years he painted seven panels on the ceiling of S. Tommaso Cantauriense’s church in Padua with the Mysteries of the Rosary. Luca Ferrari died in 1654. He was an able decorator with a strong narrative vein and a venetian palette and he is also considered the most significant witness of the links between the Venetian and the Emilian painting in the seventeenth century.